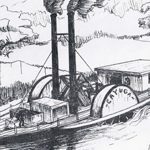 For 11 days in April of 1836, the capital of Texas was the steamboat Cayuga. The 80-ton side-wheeler had been hauling cargo on the Brazos River during 1834 and 1835. After their victory at the Alamo on March 6, 1836, Mexican Gen. Antonio López de Santa Anna and his troops began moving toward Harrisburg (today it’s a part of Houston), pursuing the Texas rebels. In early April, David G. Burnet, the interim president of the new republic, impressed the Cayuga into public service to transport provisions to the Texas army. On April 15, Burnet and his cabinet boarded the Cayuga just ahead of the advancing Mexican army. The steamboat made stops at Lynch’s Ferry and New Washington, in the vicinity of today’s Morgan’s Point in Harris County, then proceeded to Anahuac and Galveston with the officials, who conducted the republic’s business as they went. The officials went ashore at Galveston on April 26, then moved to a succession of locations before finally settling in January 1839 in the new capital at Waterloo, which soon was renamed Austin. Share the post "The Floating Capitol of Texas"